German Air Force JBG31 (2nd Staffel) flying the F-104G, based at Norvenich, exchanged with the USAFE 92 TFS/81 TFW stationed at Bentwaters, UK, flying McDonnell F-101A and C Voodoos. German personnel already flew to Bentwaters September 6th to prepare the arrival of the F-104s. Sadly the weather was poor so they had to land on another Airbase. The next day they still arrived in time before the Starfighters came in. It was a two-way exchange. Also the Voodoo’s flew to Norvenich AB. Norwegian Air Force 331 Skv at Bodo AB flying the F-104G exchanged with the USAFE 417 TFS/50 TFW, based at Ramstein AB Germany, flying the F-100D Super Sabre. It was a two-way exchange. 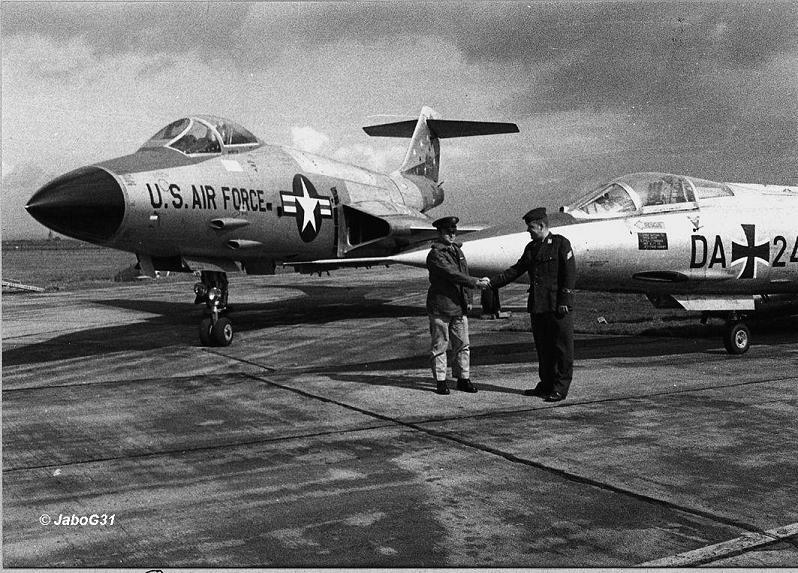 Seen at Ramstein were F-104G aircraft : 61-2628/FN-D, 62-12234/FN-S, 62-12240/FN-X and TF-104G 62-12264/FN-Z. (Thanks to Birger Larsen for the Norwegian serials). German Air Force JBG33 from Buchel AFB, flying the F-104G exchanged with the Italian 154 Gruppo (6th Aerobrigata) based at Ghedi also flying the F-104G. It was a 1 or 2-way exchange but at least the German Starfighters were seen at Ghedi in October. Sadly no aircraft serials are known.